I’d been waiting for a year for a North Texas Volkswagen event which is fast becoming the largest in Texas. 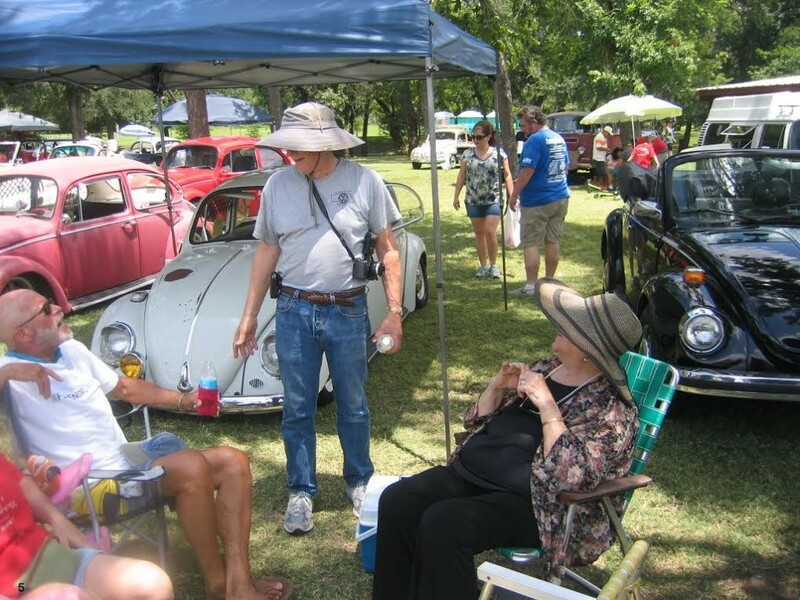 We’re not California, but when a good sponsor announces a show, the Texas VW Community responds enthusiastically. I am one of those responders. In advance, I had a few things which I wanted to do to our ’67 Beetle. The main one was to remove the front bumper, clean the parts, repaint the backside of the blade, the brackets and the spacers—it was time. Then, we planned our drive to the show. Hardly had Neva and I accomplished this feat than I received an e-message from a good VW friend in Nebraska. Richard Marcoux and I first corresponded some years ago—so long ago that we don’t recall why. Richard is the kind of guy who, when he sees that special car, he goes for it. Or that special accessory. 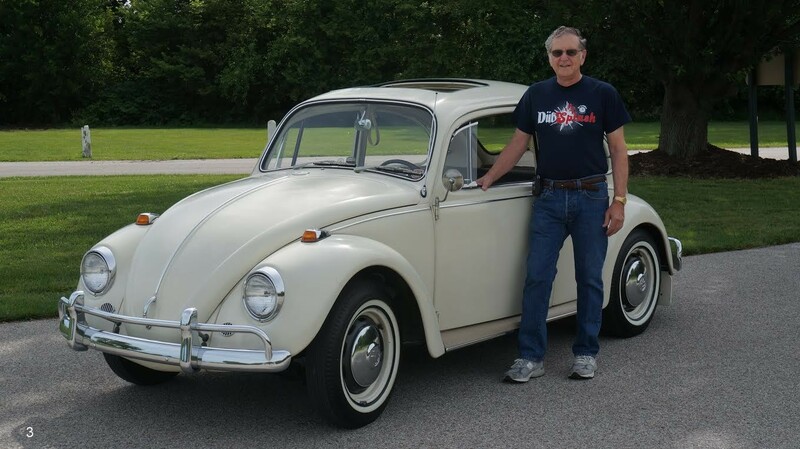 As a result of Richard’s knowledge of the 1967 Beetle, he has made some significant contributions to Articles for 1967beetle.com How about this one? What a surprise this latest e-message was! 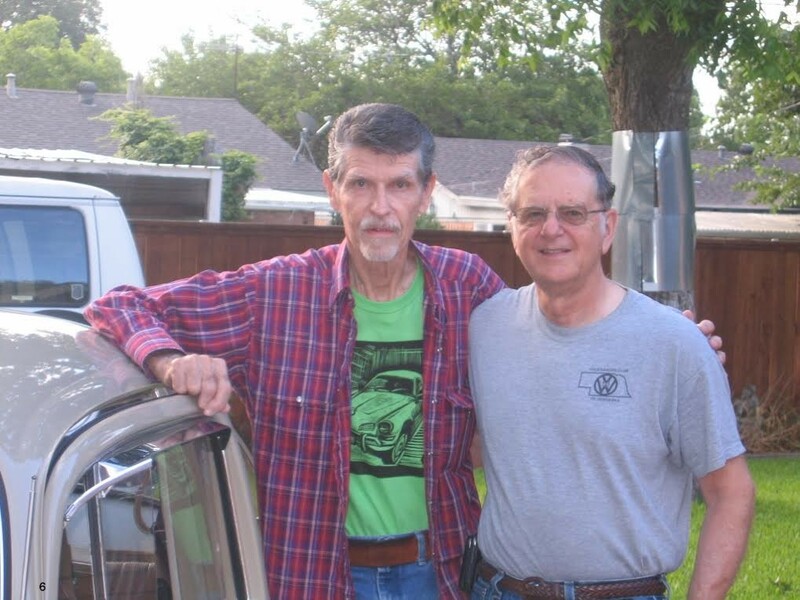 Richard was driving to the Dallas, TX, area to attend the same Volkswagen Show! We messaged back and forth and then talked by phone. How to coordinate so that we would be sure to see one another. We decided that Richard should stay with us so that we could maximize our VW Talk Time! You think that I am kidding? Ha! When Richard arrived, we talked non-stop. I had plenty of questions about Richard’s two 1967 Beetles. You would too. Here’s why. Richard has a 1967 Beetle Convertible. It was the car he’d been watching and waiting for—and it popped up. Not just any Convertible—THE Convertible. You see, this car is all original, never restored. And what a beauty this Lotus White ‘Vert turned out to be. You can understand my excitement over first seeing photos of this car when you consider that this vehicle represents exactly what rolled out the factory doors at Osnabruck! In my opinion, if this Convertible is not the finest in the World, it certainly is one of the best. I am picky—with this car, there’s nothing “to pick”. It’s all there. Okay—let your heart stop beating a bit before I tell you the about the other car. Are you ready? This second Beetle is a 1967 Sun Roof Edition. It, too, never has been restored. And it is Lotus White to match the Convertible. I’ve consulted Richard about such things as the manufacturer of a particular bolt. Yes—this car is that good. While Richard and I were at the Dallas show, we talked with another VW guy. 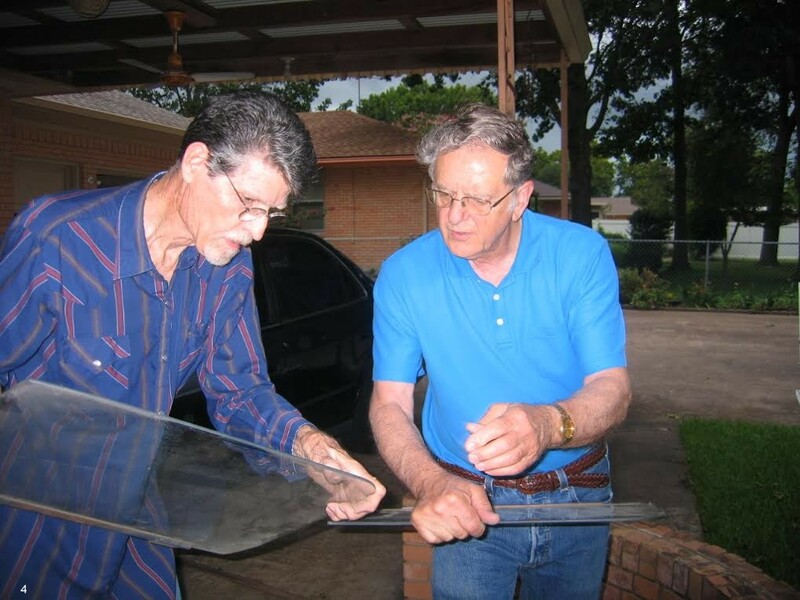 “I know your car—it’s that original Sun Roof ’67!” the other guy told Richard. “It’s the one you drove down to Texas!” We all had to smile. It’s a really special car when people remember it that specifically from a past showing. Richard and I talked about Volkswagen shows and our dismay over some of the judging mistakes which commonly happen. All too often judging simply is a popularity contest without much technical basis for determining the merits of one car over another. Some of us collect memorabilia on a regular basis. One of the things which Richard collects is 1967 Beetle promotional advertisements. Off the top of my head, I tested his collection knowledge. “Do you have the air conditioning ad where the ’67 Beetle is in a block of ice?” I asked. “Yes—I have that one”, he responded. Right. He knows! And, of course, we talked about Volkswagen parts. While Richard was here, a couple of VW people stopped by to pick up parts. Some days, the Salser house is Parts Central! LOL Richard and I also examined some parts. For me, studying VW parts is a steep learning curve but always one which keeps my brain from going stale. Our families were an important part of our prolonged discussions. It’s exciting how entire families become involved with Volkswagens so that owning and driving them isn’t limited to only one member of the family. Richard finds a staunch ally in his wife, Donna. When Richard discovered the Convertible, Donna urged him to buy it. A guy sometimes needs that extra bit of nudging! Well, Richard is forever glad that Donna gave him that advice. Our daughter, Janeva, came to the house for a visit while Richard was here. She grew up, quite literally, in the back seat of ’67 Beetles. She helped to work on them and learned to drive them. It was only natural. 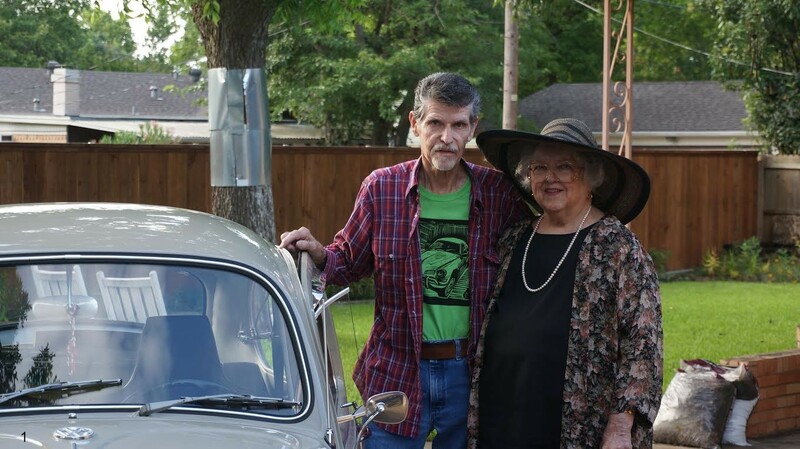 She and her brother drove Beetles to high school, to work and even to college. 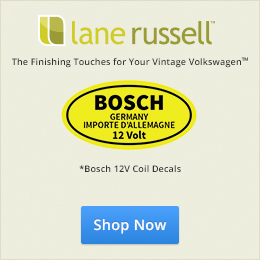 We had a good time recalling our collective Volkswagen past. At the Show, Richard and I cruised the swap area. We would stop to look at and finger this part, discuss that part and talk with the vendors. We talked with the owners of cars—any Volkswagen—not just the ‘67s. We were expanding our circle of acquaintances and interests. We snapped photos. Several of our special Volkswagen friends were sitting together near our ’67 Bug. Richard got to meet them and talk. At the end of the day, Neva, Richard and I were smooth worn out! But, happily so! Richard arrived about noon on Saturday and left about 9 AM on Monday. We knew that we’d not gotten everything said that needed to be discussed. As he drove away, we made a promise which we hope that we can keep—to see one another again. Who knows. Are Nebraska and Texas really that far apart? And……. The ’67 Beetle is the car that brings us all together. I’m still amazed that so many people around the world take interest in the “one year only” ’67 Beetle. Great article, Jay! For me? A white 67 VW convertible as in the picture is the ultimate, with the sunroof version a close second. Wow! How exciting to own two unrestored ’67 Volkswagens! Richard, I am glad, and envious, you were able to meet Jay, Neva and the entire Salser Family! Until your visit, I was in the same boat and have only spoke to Jay on the phone and exchanged emails! I would like to some day meet Jay and Neva also! Great job on your collection and getting down to Texas! Hello Jay. 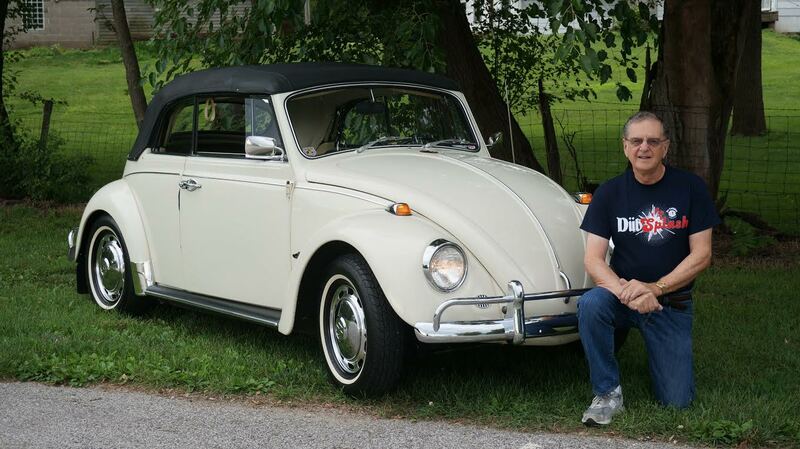 The 67 VW stories/information you and your VW friends share with us are just awesome. Jay this is excellent! The transferable “value” in life is creating friendships and experiences like these. There is nothing more pleasing than to engage with a 67′ owner or VDub person in general. I hope someday this community came come together “live” and share all things Beetle! A 50th Year Reunion so like a good idea. The mid-west could be one possible location. Have to find out who/how would be interested. Sure is something to think about. I’ve been thinking about it…..
Eric I think you need to reach out to the “Math Majors” on this one and find a equadistant point on the map to celebrate. 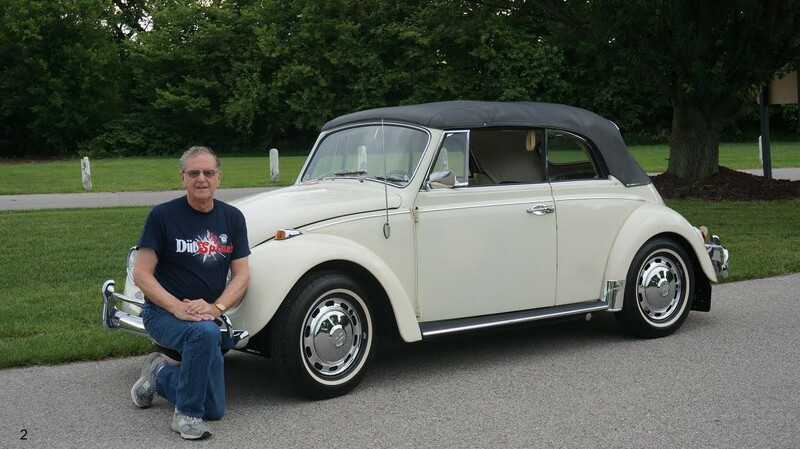 A 50th Reunion could be a game changer for 1967Beetle.com!! Agree. I wonder how many people would come across the world? Imagine 100 ’67 Beetles driving down the road together… Wow.